Of the thirty contingencies included in this year’s Preventive Priorities Survey, renewed tension on the Korean Peninsula following a collapse of the denuclearization negotiations was assessed as a top tier priority for the United States in 2019. The contingency was deemed moderately likely to occur and, if it does, will have a high impact on U.S. interests. Historically, U.S.–North Korea denuclearization negotiations have proceeded haltingly. Efforts to dismantle North Korea’s nuclear weapons program have spanned several diplomatic initiatives, including the Six Party Talks between the United States, China, Japan, North Korea, Russia, and South Korea, which started in 2003 and resulted in several attempts at establishing disarmament principles. In 2017, initial interactions between President Donald J. Trump and North Korean leader Kim Jong-un did not look promising for continued diplomatic engagement, as Trump and Kim exchanged bellicose remarks and tweets. However, in 2018, both Trump and Kim indicated an interest in re-starting negotiation efforts. Following two successful meetings (one in April and one in May) between South Korean President Moon Jae-in and Kim at Panmunjom, Trump met with Kim in Singapore in June to discuss denuclearization on the peninsula—the first time a sitting U.S. president and North Korean leader have met in-person (previous diplomatic initiatives have largely involved cabinet-level envoys). Kim has also traveled to China and South Korea for talks. Another high-level summit between Trump and Kim may occur in 2019, with negotiations currently underway to confirm a meeting location. 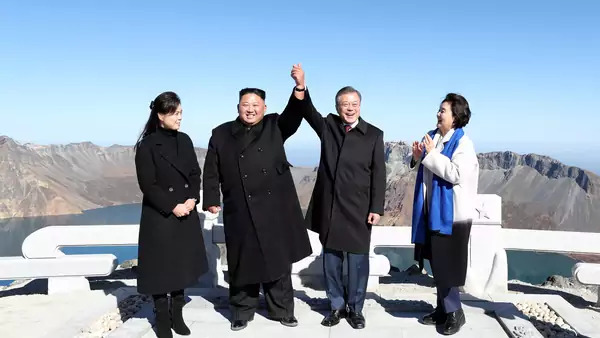 However, recent speeches by Kim, Moon, and Trump indicate a possible misunderstanding of what denuclearization of the peninsula will mean for each of the parties. Kim continues to assert that denuclearization will include the entire Korean peninsula and that the United States should ease sanctions to indicate a commitment to negotiations. For Moon, denuclearization talks have provided an opportunity to discuss the improvement of economic ties between North Korea and South Korea, and an end to the armistice that has largely governed Korean relations since 1953. The United States, meanwhile, has requested that North Korea cease its nuclear weapons tests and dismantle its nuclear program. Though U.S.–North Korea relations have changed markedly from last year’s survey to this year’s, as the Trump administration re-engages North Korea in denuclearization talks, further opportunities for misunderstanding are rife. A collapse of the current talks would have a significant impact on U.S. interests, as well as that of allies like Japan and South Korea. At the low end of the risk spectrum, an end to talks could result in more nuclear tests by Kim—with concomitant instability on the Korean peninsula—and cyberattacks; at the high end, a military confrontation between North Korea and the United States or a U.S. treaty ally remains within the realm of possibility. The Preventive Priorities Survey was conducted in November 2018, and reflects the expert opinion of respondents at that time. As such, it should be viewed as a snapshot assessment. Recognizing this, CPA tracks ongoing conflicts, including the North Korea crisis, with our Global Conflict Tracker. For an overview of U.S.-North Korea nuclear negotiations, view CFR’s interactive timeline.